WARNING: Saltwater etching produces very small trace amounts of non-toxic hydrogen gas (not enough to be of any concern regarding combustibility) and toxic chlorine gas. Do not position your head directly above the glass container while etching, do not inhale said gas and only perform saltwater etching in well ventilated areas such as outdoors. Please don't let this scare you away from doing any saltwater etching. You won't actually notice the gas via smell or sight as the quantities are very minute. Still, proper precautions should be taken. I take no responsibility for any unwanted damage or effects this process may have on you, anything you saltwater etch or anything you use in the saltwater etching process. Use this tutorial at your own risk. 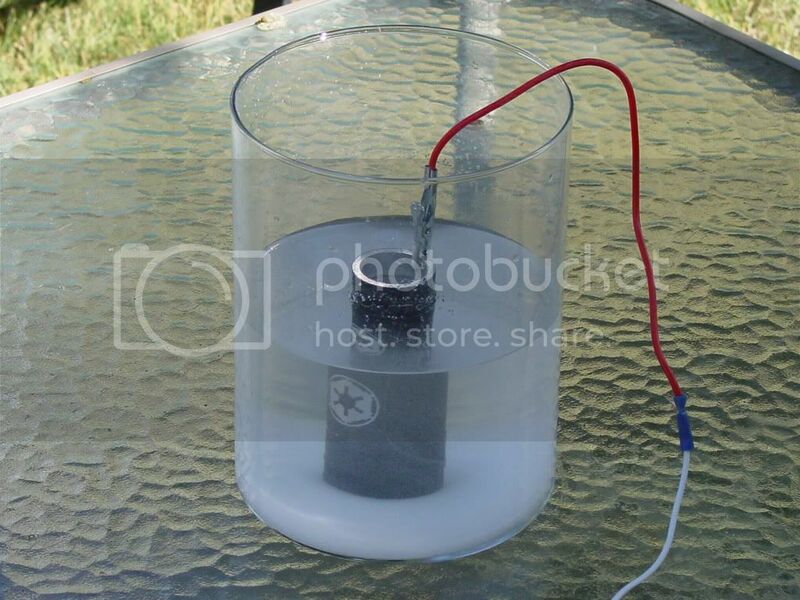 You do not need to use the same size, shape and type of glass or plastic container, the same size, shape and type of metal for connecting the negative lead to or the same size, type or voltage of batteries/power source and battery holder I used in this tutorial. Mine is but one way to do it. Please use whatever suits your preference or what you have available to you. This tutorial teaches basic saltwater etching of non-ferrous metals such as aluminum, brass and copper and is specifically designed more for those in the hobby of custom saber making. However the basics in this tutorial can help with other saltwater etching projects. 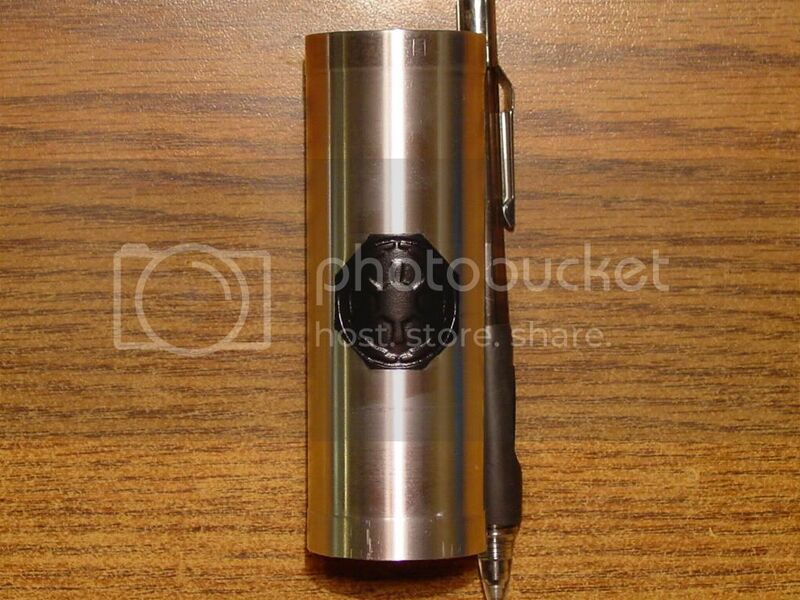 Saltwater (or salt water) etching uses saltwater and DC current to etch designs into metal. It is for the most part, easy, fast and affordable to do. You just need several easy to acquire items. Please keep in mind that there is more than one way to etch metal using the saltwater method, this is just how I do it and hopefully this tutorial will help those wishing to try saltwater etching for themselves. I'm not going to go into the science of how saltwater etching works. I'm just going to explain step by step how to etch saber parts using saltwater. A glass or plastic container such as a flower vase, casserole dish or food container. Four D cell batteries & one four-D cell battery holder or... an adjustable power supply or... a vehicle battery charger that can be set to 6 volts. Note, many vehicle battery chargers will not work for salt water etching. Do some online research to determine which ones will work. Two alligator clips attached to wires. A 12" long (or so) piece of metal such as a small flat bar or rod, preferably of the same type of metal as what is being etched. A hobby knife, preferably with a sharp pointy blade. Removable full sheet labels designed for use with inkjet and/or laser printers. Masking tape designed for painting applications. Optional items would be a personal computer, a printer, a pen/pencil, a soldering iron, solder, heatshrink tubing, a lighter/match/blowdryer (for the heatshrink tubing), electric oven, foam sanding sponges and a metalworking lathe (the foam sanding sponges and lathe are for paint removal). When preparing a design to be etched into metal, the first thing one should be aware of is that only bare metal will be etched. 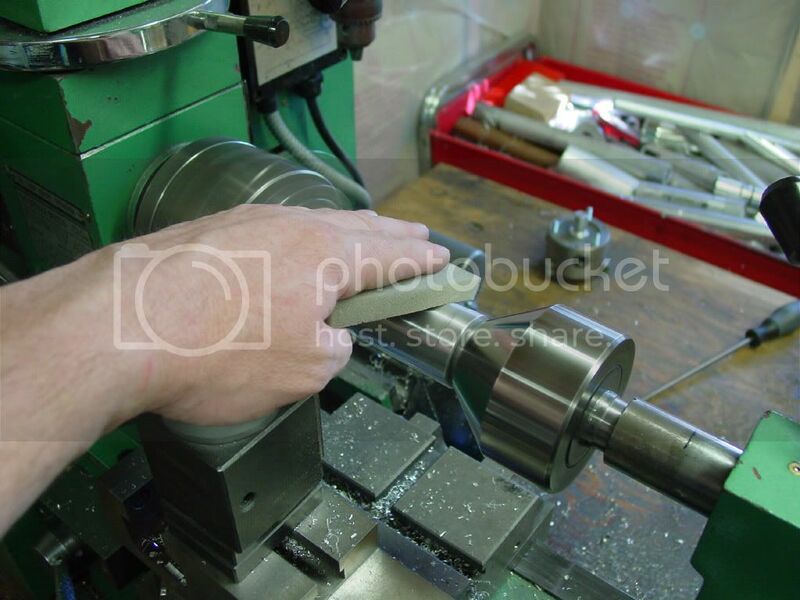 Therefore the rest of the metal not being etched needs to be protected by using a "resist". A "resist", when used as an etching term, is a substance designed to prevent the saltwater from etching into the metal. Enamel and acrylic spray paints make for a great resist. Since not all paints are created equal. Some paints will work better than others when used as a resist. Therefore experimentation on test pieces is recommended before moving on to an actual saber hilt piece (I have found that Rustoleum Flat black and Krylon Black primer work well as resists while still allowing easy sticker removal. For this tutorial, I used two coats of black primer followed by 6 coats of flat black). Electrical tape also makes for a great resist which is helpful for when you don't want to paint the entire part. This makes paint removal after etching a much easier process as there is a lot less paint to remove. 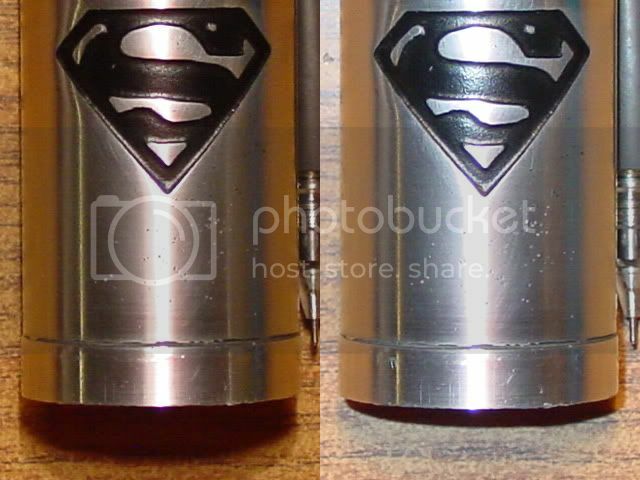 Please keep in mind when making a stencil that only the bare metal will be etched. NOTE: If the saber part to be etched is not completely submersed in water, only that which is submersed will be affected by the etching process. 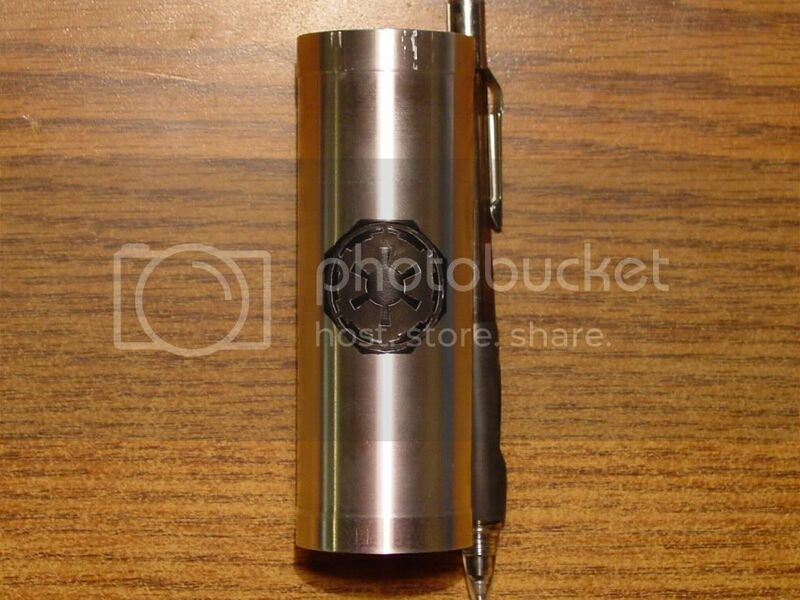 If the saber part is to be completely submersed in water, please keep in mind that the positive lead still needs to make proper contact with the saber part and if under water, could cause the alligator clip and the part of the saber that it connects to, to become eroded by the saltwater etching process. NOTE: It is usually a good idea to apply a resist to the inside of a hollow tube type of saber part, especially if the part will be completely submersed. 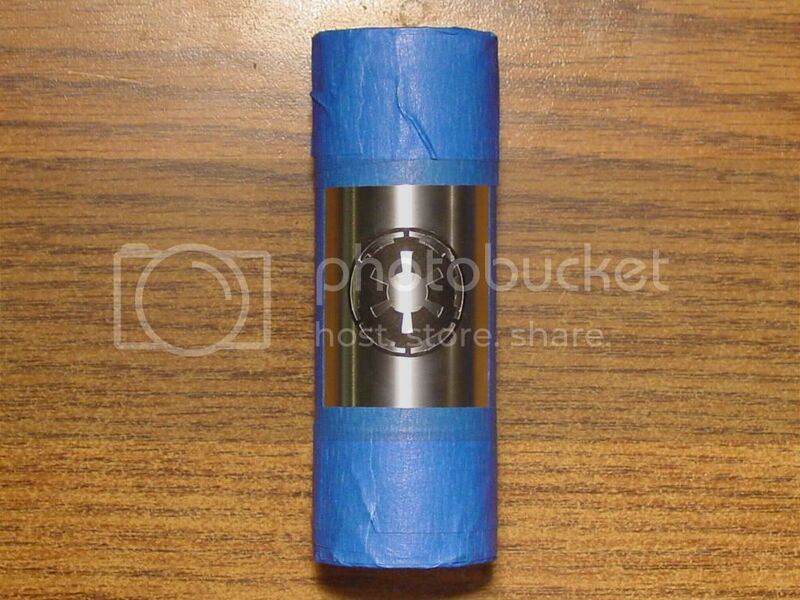 In other words, it is a good idea to cover the entire inside of the tube with vinyl tape. 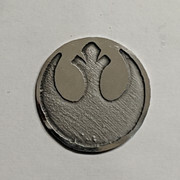 I have ran several saltwater etching tests and what I have found is that for parts not completed submersed, usually only the bottom edge or the bottom inside area gets eaten away a little bit. For parts completely submersed, a lot more of the inside of a metal tube can be eaten away by the etching process. As such, it is a good idea to tape up the inside. 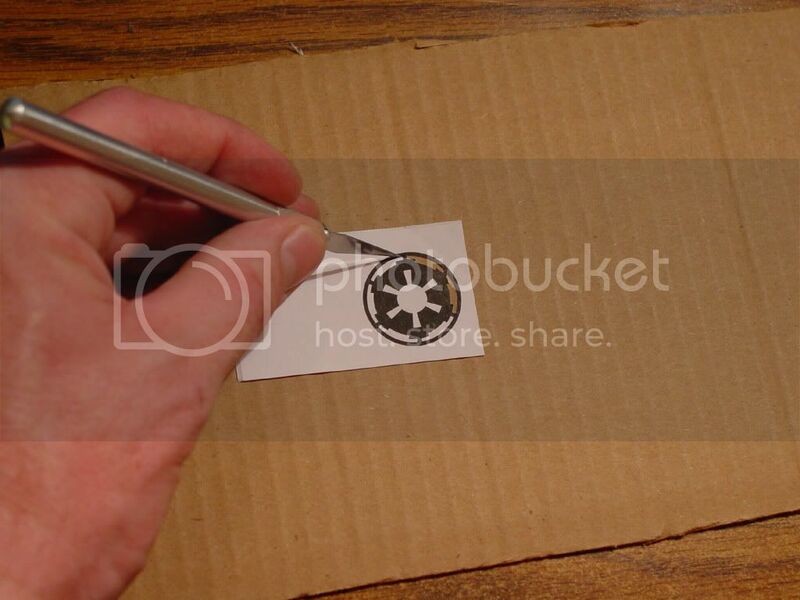 There is more than one way to make and apply a stencil to a saber part. For this tutorial, I will be using a type of adhesive backed printer paper that is designed to be easily removed. 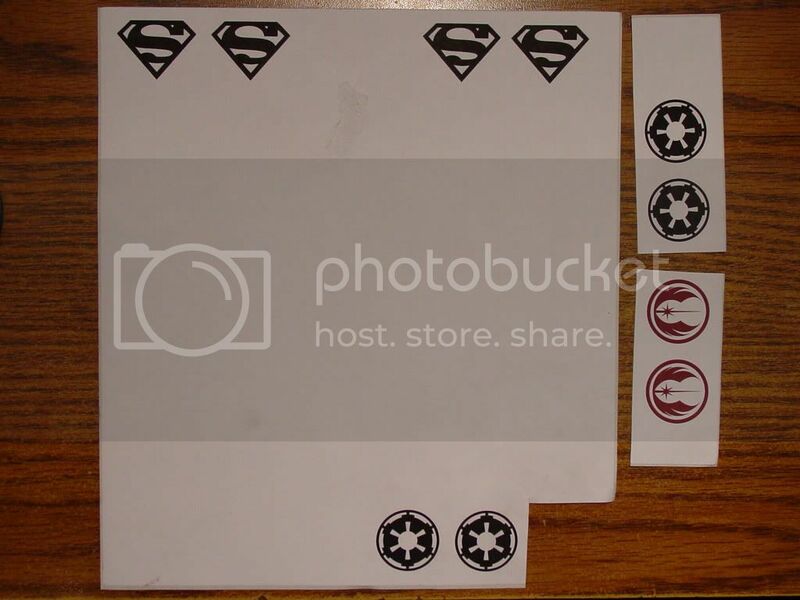 This also allows for any design or image you may have on your computer to be printed out and used as a stencil. 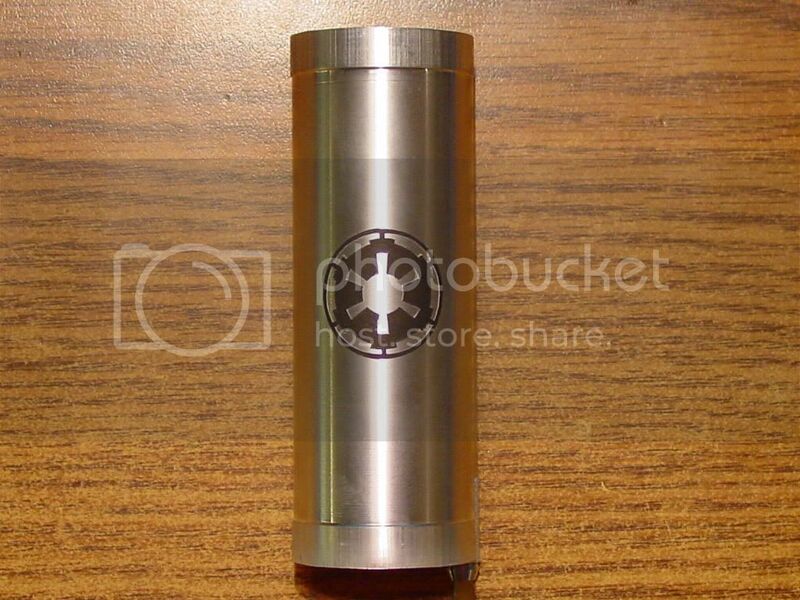 For this tutorial, I will be using a scrap piece of aluminum to be etched instead of an actual saber part. The scrap aluminum is around 1.5" O.D. and 1.25" I.D. The saber part to be etched should most definitely not have any other saber parts, greeblies or electronics in it or on it. However epoxied-on metal parts should be ok as long as they have a "resist" applied to them or are above the water line. Attach the alligator clip wires (not the clip end) to the positive and negative leads of the battery holder. Either solder the wires together and use heat shrink tubing on them or twist the wires together and wrap them in vinyl tape. Prepare the saber part to be etched by removing all dust, oils and contaminents. 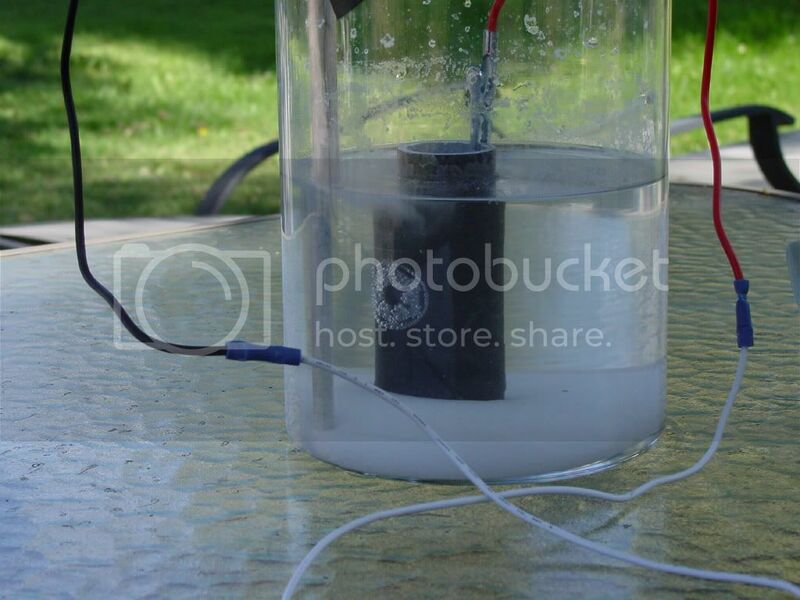 This can be done with cotton balls soaked in acetone. One should wear protective rubber gloves when using acetone. Please be sure to read and follow the warnings and safety precautions on the acetone container. Be careful not to get any acetone on any paint that is on parts you wish to keep painted. Make sure the part is dry after cleaning. Draw or print a design onto the removable adhesive backed printer paper. Cut out and remove the parts of the design that will NOT be etched using a hobby knife. You may want to rest the paper on some cardboard when cutting, to help prevent dulling of the blade/damaging of the work area surface. Use scissors or a hobby knife to cut out the outside shape of the design. Carefully remove the protective backing from the design. 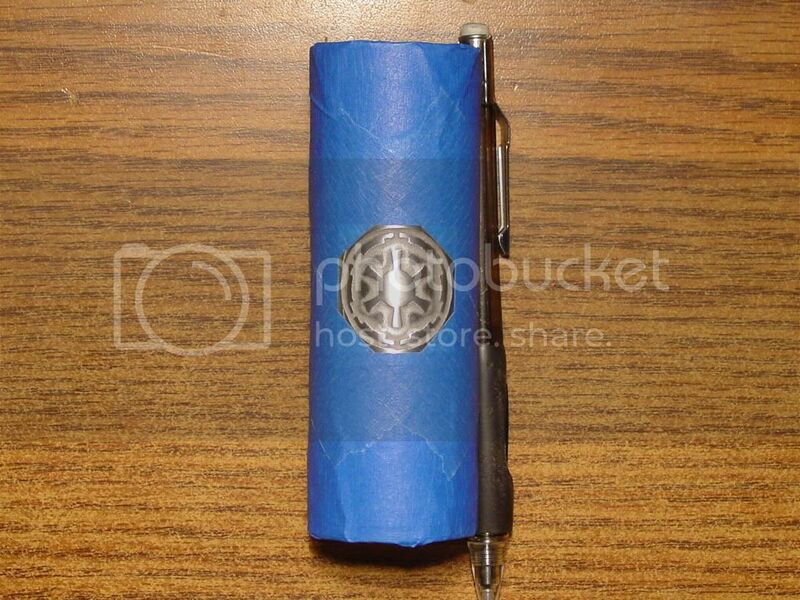 You may need to use the sharp edge of a hobby knife to start the seperation of the protective backing from the paper. 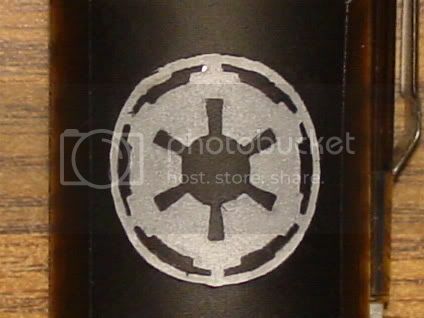 Once the backing is removed, carefully apply the design to the saber part to be etched. Using painters masking tape, mask off the parts of the saber part that you do not want painted (this can include open ends, threads, switch holes, etc.). Now you are ready to paint the saber part but please read the following before you do. After painting you will need to remove the masking tape and the sticker. 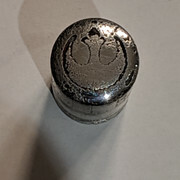 However the paint used as well as whether or not the paint was cured by baking the saber part in an electric oven (with the sticker still on the part), can and will, affect how easily the sticker can be removed as well as if it will take any paint off the metal with it when removed. Gloss paint, is a bad idea whether baked or not. When unbaked, removing the sticker will take paint with it. When baked, it's very hard to remove the sticker and the paint chips easily. Flat black works extremely excellent but only if baked. When unbaked, some paint will come off with the sticker. Using primer works great when unbaked and the sticker can be removed after only 5 to 15 minutes after the last coat went on. However primer will not leave as clean of lines as flat black and some of it will disolve during the etching process. However it makes removal of the primer with acetone extremely easy. NOTE: Baked paint is very hard to remove with acetone unless the saber part is completely submerged in acetone for a day or two. See the note in the optional section below for additional information on removing baked-on paint. 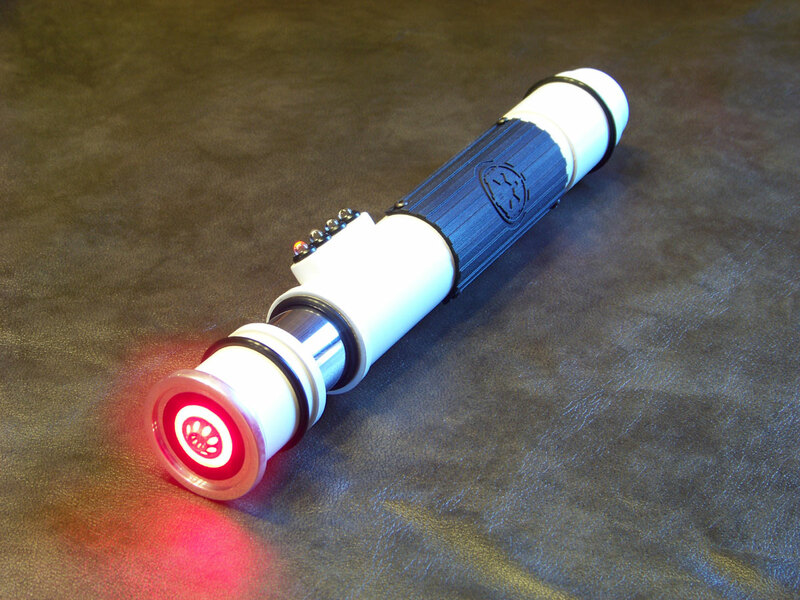 Paint the saber part using spray paint or spray primer. Make sure you apply enough coats of paint to completely cover the part. Allow the recommended drying time between coats for the paint being used. Once the paint is dry, remove all masking tape as well as the design sticker. Optional: After painting, remove all tape and bake the saber part in an electric (not gas) oven at 200 or 250 degrees fahrenheit for one to four hours. The temps and times can vary. Just use whichever seems to be hot enough and long enough to you for the paint to be fully cured. Note: This option will make paint removal in a later step, much harder and is only recommended for those that can sand the paint off using a metalworking lathe and foam backed sanding material. Use vinyl tape to cover any unpainted areas you do not want etched. If the entire part was painted, ignore this step. The saber part is now ready to be etched. Mix up a solution of cold tap water and salt in the glass or plastic container. For this setup, I used 1 part salt to 4 parts water (i.e. 1.5 cups of salt to 6 cups of water). Stir and mix the salt with the water as best you can before inserting the saber part. There may be a lot of salt build up at the bottom of the container. I often use a cap from a spray paint can to keep my saber parts raised up above the top of the salt. Insert the saber part into the water and attach the alligator clip that is connected to the positive lead of the battery holder to the saber part, above the water line if possible to prevent the alligator clip from being "eaten away at" by the saltwater etching process. Electro-etching is the opposite of electro-plating. When etching metal, the rod or flat bar that you put into the saltwater to attach the negative lead to, will become plated (not necessarily well plated though). 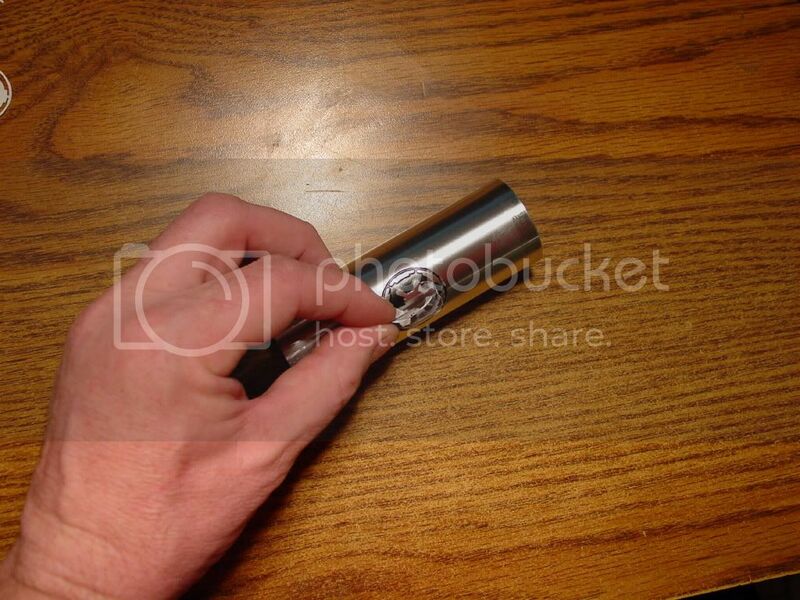 As such, that metal will ideally be the same metal as what you are etching, i.e. use a copper rod/bar when etching copper, brass for brass, etc. However this is not necessary, just "ideal". Insert a small piece of metal (I used a 3/8" dia. 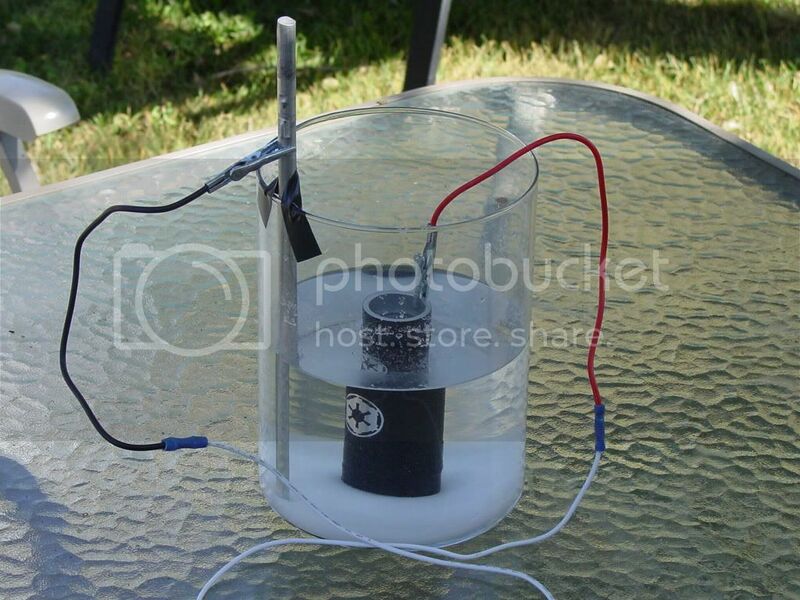 aluminum rod for this tutorial) into the container (one that sticks out above the water line) and attach the alligator clip that is connected to the negative lead of the battery holder to the metal, above the water line to avoid metal buildup (plating) to the alligator clip. Rest the metal against the inside wall of the container. If necessary, use some tape to hold it to the side of the glass or plastic container to keep it from falling. NOTE: The closer the saber part is to the metal that the negative lead is attached to, the faster the etching process will be. Logically, the part of the saber part that will be etched, will etch faster if facing the piece of metal that has the negative lead attached to it. The etching process has now begun. 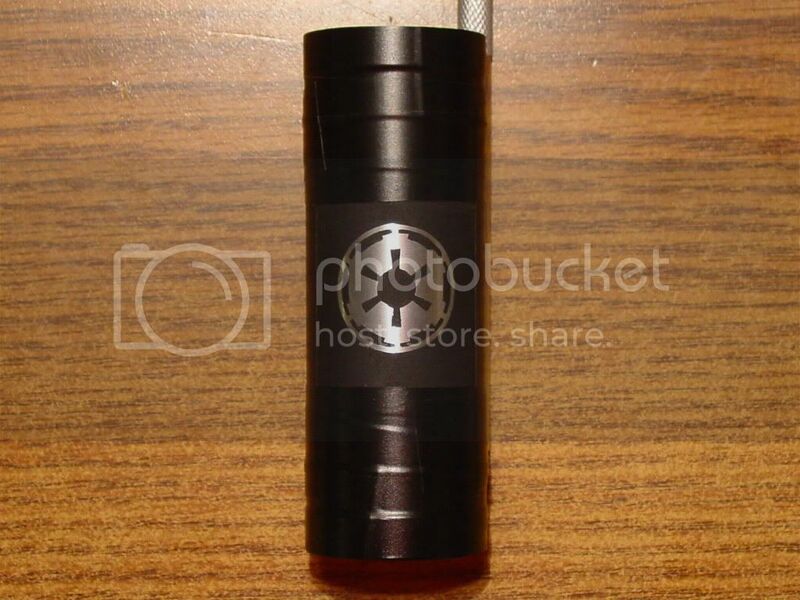 You should see tiny bubbles form on the saber part but a lot of them will be coming up from the piece of metal with the negative lead attached to it. If you see them coming up from the saber part instead, you accidentally reversed the polarity. Let the part etch until it has etched deeply enough for your tastes. This may involve you removing the leads and the saber part from the saltwater for examination, several times. With my setup using four D batteries, I get a .014" depth in 30 minutes using small 1" designs. NOTE: The time it takes to etch to a certain depth can vary greatly depending on the amount of water, salt, current and the surface area of the design being etched as well as the surface area/resistance of the metal piece that the negative lead is attached to. EDIT: I know it looks like the first post was made a long time ago and this one looks like it was posted recently ('cause it was) but that's because when I first made a thread for this topic, instead of making two posts in one thread (like it is now), I made two separate threads... doh! Since no one has posted in this thread, that allowed me to correct that mistake. Once your saber part has finished etching, remove the leads and saber part from the saltwater, remove any tape from the part and clean it using warm water and a cloth. Be sure to remove any salt buildup from the inside of the saber part. Use cotton balls soaked in acetone (or a metalworking lathe and foam sanders) to remove all the paint you previously applied for etch prepping. Again, be sure to wear protective rubber gloves when working with acetone. Dry off the part when done. NOTE: If the paint is not coming off easily enough, you may have to submerse the part in acetone for a few days. Since acetone evaporates quickly and can eat through plastic, if you decide to submerse the part, I recommend using a glass (NOT plastic) container and covering it with aluminum foil. You may have noticed in the pic above, that the etched depressions look a little rough in texture, almost as if media blasted. One way to fix this is by sanding and/or painting. You might also be able to buff the etchings smooth using a rotary tool such as a Dremel with a buffing wheel attachment and buffing compound, depends on the design. If the etched part is sanded or painted AND sanded, it may not look good/smooth unless all sanding was done on a lathe. If you want to paint the etched depressions but do not have a lathe to sand off the paint, I recommend no sanding whatsoever. Instead I recommend a paintbrush and a steady hand (an inverse version of your design stencil could come in handy here to help avoid painting areas you do not wish to paint). For those that do have a lathe, I have provided instructions below on sanding and painting the etched metal. NOTE: Sanding can dull the etched design and make it look weathered. Sand at your own risk. The following information involves paint removal from a round, hollow saber part via sanding, using a metalworking lathe and foam backed sandpaper. This infomation also includes steps on painting the etched parts (after the initial paint removal has been completed) as well as removing the paint used in that process from unwanted areas. 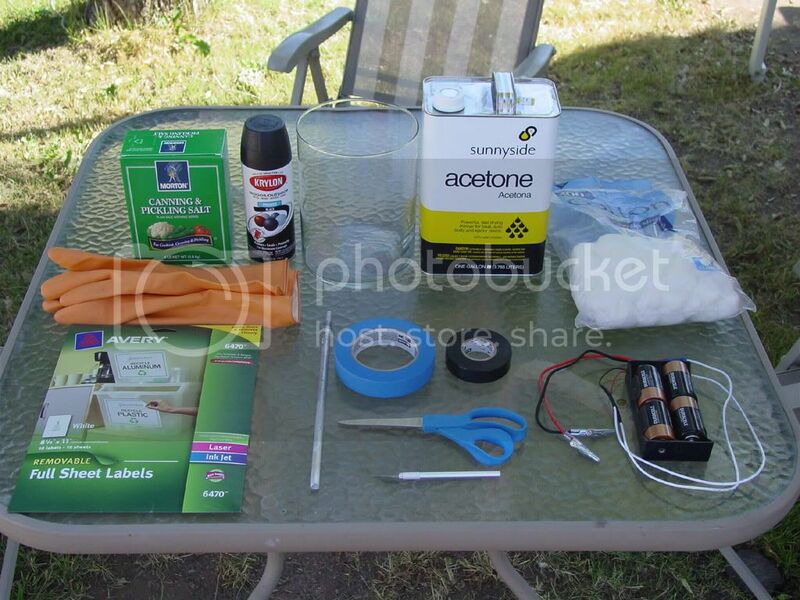 In relation to Step 13 above; if you do not wish to use acetone to remove any paint, put the saber part in a lathe and sand off all paint using foam sanding sponges. NOTE: Sanding can dull the etched design and make it look weathered. Sand at your own risk. Remove the saber part from the lathe, dust off any paint residue and mask off areas that you do not want painted. Paint the saber part and let it dry. Then remove all masking tape. Optional: After painting, remove all tape and bake the saber part in an electric (not gas) oven at 200 or 250 degrees fahrenheit for one to four hours. The temps and times can vary. Just use whichever seems to be hot enough and long enough to you for the paint to be fully cured. NOTE: Steps D and E are to help prevent unwanted paint removal from the etched design. Draw or print the same design that was used for etching, onto the removable adhesive backed printer paper. Cut out and remove the same parts of the design that that were cut out before as well as the outside shape of the design. Carefully remove the protective backing from the design. 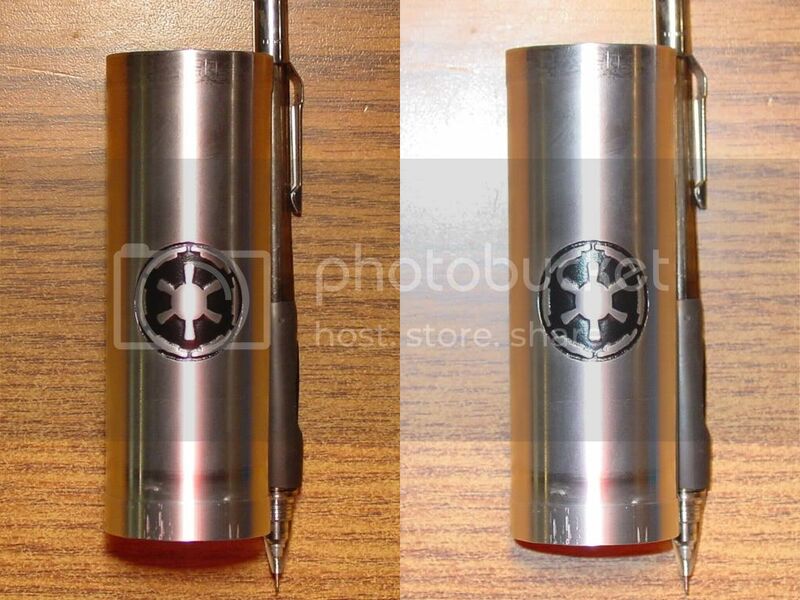 Once the backing is removed, carefully apply the design into the etched areas of the design on the saber part. Put the saber part in a lathe and sand off all excess paint using foam sanding sponges. Remove the saber part from the lathe and dust off any paint residue. Remove all of the adhesive backed printer paper and it's glue residue, from the saber part. Do not use chemicals to do this as it may damage the paint. You can use your fingernails to get underneath the sticker to start removing it and you can use friction from fingers and thumb as well as a soft cloth (such as a T-shirt or microfiber cloth) to remove the glue. That's it. 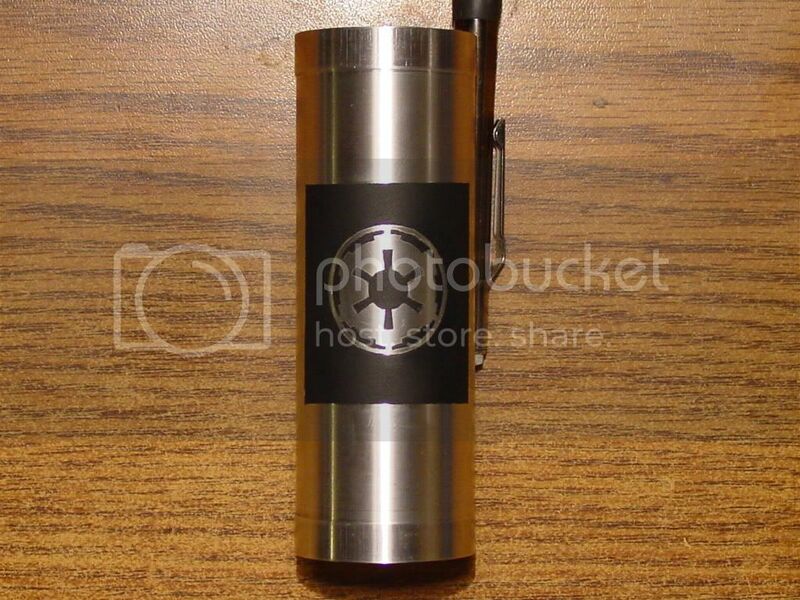 You should now have a painted, etched design on your saber part. Thanks for sharing this! I know a lot of effort goes into preparing a tutorial like this and it's much appreciated. I'm definitely going to try thus method in the future. I was wondering : do you thus nail polish would work as a resist? It would probably be easier to remove. Nail polish might work but may need to be baked to fully cure. I've tried paint pens but they did not work so well. The toner transfer method used by those that make their own PCBs for electronics is superior to the stencil method in the above tutorial and is what I use now, however I have not finished my tutorial on that method yet. It's a lot quicker and easier and provides much sharper detailed images. However you do need to own a laser printer (not the Brother brand printers though as their toner and melting temps for the toner are not conducive to etching). I know this is an old thread, but I just wanted to say thanks for the tutorial. I gave it a try today with wonderful results. I had a difficult time getting a good mask. I tried nail polish, but if I let it dry too much it would lift when I took off my sticker and if it wasn't dry, the edges were rough. Despite this, I can see the potential. I also tried metallic silver paint as a mask, because it was the only enamel I had handy, and I wondered if it might conduct. I used it in lemon juice and vinegar and ended up with a very cool weathered result. Kosher salt, 12V 20 minutes. Interesting how there are diagonal lines. Just the way the aluminum was made I guess. EDIT: Now that I think of it, the piece was hanging diagonally in the solution. I bet those lines are from the bubbles moving up and the little dots on the bottom are probably a couple of bubbles stuck there. Maybe I should try lower voltage, but it could also be used to create a cool effect. Lemon Juice and Vinegar, 12V 1.5 hours. This would make a cool activation button. Nice results. I'm glad this ancient tutorial of mine was useful. Sorry about the pics not showing. They still work as they show up on other forums but this forum has disabled any pics hosted by Photobucket (and for good reason). I need to get them hosted elsewhere. The pictures show for me. Good tutorial. It shows everything needed to get the job done. This is inaccurate. Photobucket photos still show up, IF the owner goes in and changes the tags to read https instead of the old http. That was a Photobucket thing, not us. I did not know that. Thanks. However for some reason the pics are now showing for me and I didn't edit the post. Probably just Photobucket up to it's usual shenanigans... or it could be Chrome or my Internet connection. Who knows? Page created in 0.339 seconds with 37 queries.